Like many of you, I have been trying to improve my knitting and crocheting skills, in large part to get good enough to tackle some of the more advanced vintage patterns from the 30s especially. The list of projects I dream of tackling is ever-expanding. Alas, at some point, I am going to have to get a bit realistic about what I will be able to make and what shall remain a pipe dream. 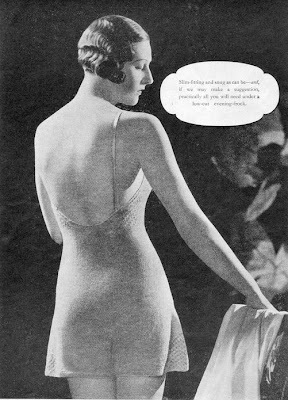 To whit, after seeing a wonderful pattern for a crocheted brassiere, circa 1933, posted by Miss Rayne, I have thought handmade undergarments might be a fabulous thing to make during the dark winter months. For NOW, though, I'm absolutely in love with the CASHMERE bra and knickers set I've seen for sale @ Anthropologie (though I wish the bottoms were a tad less skimpy and a bit more like the longer style shown in many vintage knitwear guides)!!! Santa Baby, are you taking this down as well? As I was composing this post, I was wondering whether anyone knew where a person could get a 30s or 40s inspired knitted step-in, and then I just visited Snoodlebug's blog this morning and noticed she found a very vintage-inspired vest (like a slip), which would be even more ideal than the one in the pic at the bottom of my post, as it's not bifurcated. Too bad the company doesn't appear to ship to Canada. Wonder if I can find something similar, as I really want my knickers in a knit this winter!!! Ooh... cashmere dainties! What a lovely idea! I am often cold (when I'm not having a hot flash) and these would be perfect! Sigh! Swoon! the one in the last pic is a dream! omg i love the 2nd pic, it's faboulous!well i love the 1st one too! Nancy: it seems like a good idea in my dreamy impractical imagination. I'll have to see how it actually works out in reality! I agree with garofit and katia: isn't that gal in that last pic just perfection!! There are reproduced, resized knitting patterns for step-ins in 'A Stitch in Time' volume 1.